To live in nineteenth-century Britain was to experience an astonishing and unprecedented series of changes. Cities grew vast; there were revolutions in transportation, communication, science, and work-all while a growing religious skepticism rendered the intellectual landscape increasingly unrecognizable. It was an exhilarating time, and as a result, most of the countries in the world that experienced these changes were racked by political and social unrest. Britain, however, maintained a stable polity at home, and as a result it quickly found itself in a position of global leadership. 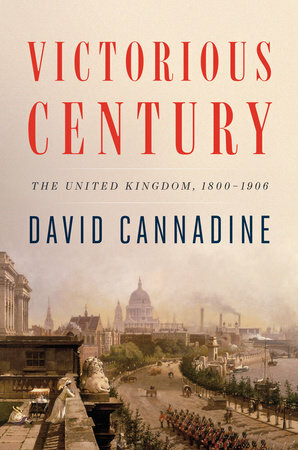 In this major new work, leading historian David Cannadine has created a bold, fascinating new interpretation of nineteenth-century Britain. Britain was a country that saw itself at the summit of the world and, by some measures, this was indeed true. It had become the largest empire in history: its political stability positioned it as the leader of the new global economy and allowed it to construct the largest navy ever built. And yet it was also a society permeated with doubt, fear, and introspection. Repeatedly, politicians and writers felt themselves to be staring into the abyss and what is seen as an era of irritating self-belief was in fact obsessed with its own fragility, whether as a great power or as a moral force. Victorious Century is a comprehensive and extraordinarily stimulating history-its author catches the relish, humor and staginess of the age, but also the dilemmas faced by Britain's citizens, ones we remain familiar with today. Sir David Cannadine is the Dodge Professor of History at Princeton University. Cannadine joined Princeton in the fall of 2008, having previously held positions at Cambridge, Columbia and London Universities. He is the author of twelve books, and the editor or co-editor of thirteen books, and his interests range widely across the economic, social, political and cultural history of modern Britain and its empire, capitalism, collecting and philanthropy in nineteenth- and twentieth-century America, and the history of history.